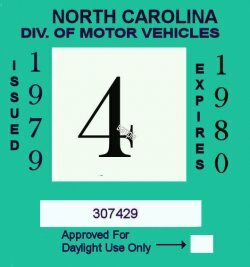 1979-1980 NC inspection sticker - $20.00 : Bob Hoyts Classic Inspection Stickers, Add a Final Touch to your Restoration! This beautiful 1979-80 North Carolina sticker was created and restored, both front and back, from a badly faded original. It was issued in 1979 and expired in 1980. The sticker is true but we took liberty with the exact color shade. If anyone finds that we are off, please send an original image and we will correct the color. Buyer will recieve a random numbered month unless specifically ordered. Buyer can order a customized sticker with your License plate number in the box that has the NO. on it for an additional $10.00.